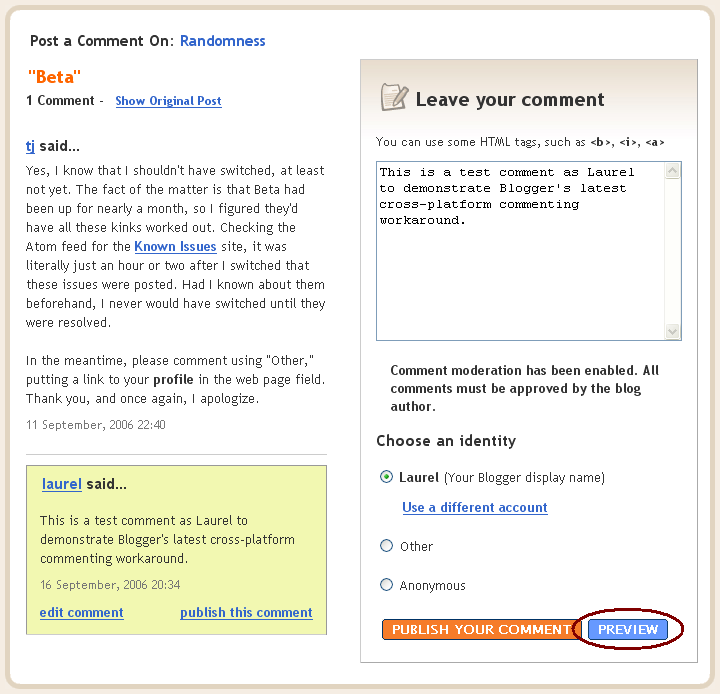 Users are seeing errors when posting comments with current Blogger accounts to blogs on the new version of Blogger in beta. Until we fix this, the workaround is to preview the comment before publishing. (You only need to preview once per account.) Update (9/13): This issue has been re-written to clarify the core bug and offer the workaround. What this means to you: If you're logged in as a blogger who has not switched (which is the majority of my readership), click the "Preview" button once you've finished writing your comment (circled at right). 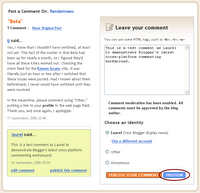 When your comment appears highlighted in yellow on the left-hand side, click the orange "Publish Your Comment" button. I will receive and moderate your comment normally. apparently, i did something wrong last time, because my last comment didn't get published. eh. i don't think there was anything important there anyway. So, thanks for warning me ahead of time that you were going to sign on as me and comment yourself!